Editor’s Note: Last week, we shared the EIA’s report on critical maritime areas that affect global energy security. This week, the EIA focused on the types of transportation flowing through those areas. Crude tankers transport much of the crude used globally. Understanding the relative size and importance of different types of crude tankers can help explain why one crude tanker coming offline, whether due to technical issues or piracy, can send shockwaves through the market. The U.S. Energy Information Administration has released its 2017 World Oil Transit Chokepoints report. 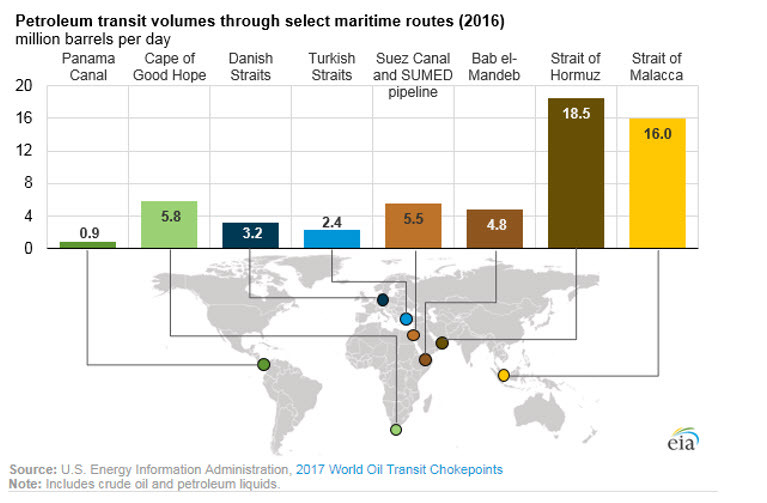 Chokepoints are narrow channels along widely used global sea routes for oil transport, with some so narrow that restrictions are placed on the size of the vessel that can navigate through them. The inability of oil tankers to transit a major chokepoint, even temporarily, can lead to substantial supply delays and higher shipping costs, resulting in higher world energy prices. While most chokepoints can be circumvented by using other routes that add significantly to transit time, no practical alternatives are available in some cases. Chokepoints may also expose oil tankers to theft from pirates, terrorist attacks, political unrest, and shipping accidents. 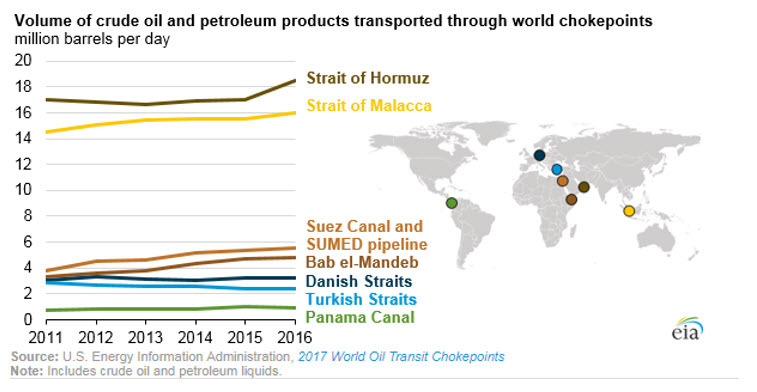 By volume of oil transit, the Strait of Hormuz (leading out of the Persian Gulf) and the Strait of Malacca (linking the Indian and Pacific Oceans) are the world’s most important strategic chokepoints. The Cape of Good Hope, near the southern tip of Africa, is a major oil trade route and potential alternate route to certain chokepoints. Ships carrying crude oil and petroleum products transiting certain chokepoints are in some cases limited by size restrictions. The global crude oil and refined product tanker fleet is typically classified using the Average Freight Rate Assessment (AFRA) system that was first established by Royal Dutch Shell many years ago and is now overseen by an independent group of shipping brokers. The AFRA system classifies tanker vessels according to deadweight tons—a measure of a ship’s capacity to carry cargo. The approximate capacity of a ship in barrels is determined using an estimated 90% of a ship’s deadweight tonnage, which is multiplied by a barrel-per-metric-ton conversion factor specific to each type of petroleum product and crude oil, because liquid fuel densities vary by type and grade. Long Range (LR) class ships are the most common ships in the global tanker fleet, as they are used to carry both refined petroleum products and crude oil. These ships can access most large ports that ship crude oil and petroleum products. An LR1 tanker can carry between 345,000 barrels and 615,000 barrels of gasoline (14.5–25.8 million gallons) or between 310,000 barrels and 550,000 barrels of light sweet crude oil. An LR2 tankers can carry 600,000 to 900,000 barrels of a petroleum product like gasoline, diesel, or light sweet crude oil. 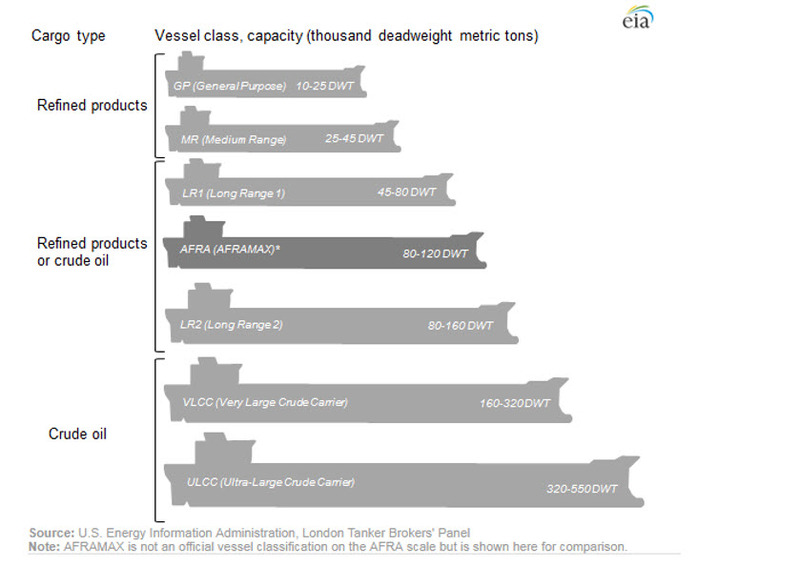 Additional ship categories, including the Very Large Crude Carrier (VLCC) and the Ultra-Large Crude Carrier (ULCC), were added to the AFRA classification system as larger vessels with better economics for crude oil shipments were deployed to serve expanded global oil trade. VLCCs are responsible for most crude oil shipments around the globe and can carry between 1.9 million and 2.2 million barrels of a West Texas Intermediate-type crude oil. Some chokepoints, such as the Strait of Hormuz, are sufficiently deep and wide to accommodate all sizes of vessels. However, ships transiting the Panama and Suez canals are subject to depth and width restrictions. Tanker traffic through the Bab el-Mandeb and Turkish straits do not face specific size restrictions, but they must deal with relatively narrow, difficult-to-navigate sea lanes. More information about energy product flows through these points is available in EIA’s 2017 World Oil Transit Chokepoints analysis.